Over the past week, a jihadist who calls himself “@abuamerican” and “Abu M” on Twitter launched into a tirade against Shabaab, al Qaeda’s affiliate in Somalia. Abu M, who describes himself as a “Mujaahid in Somaalia,” is purportedly linked to American jihadist Omar Hammami, the Alabaman traitor and al Qaeda operative who calls himself Abu Mansour al Amriki. Hammami has claimed he is being persecuted by Shabaab for publicizing a purported split between foreign jihadists and local Shabaab forces. But Hammami’s dispute with Shabaab is more likely due to personal issues with Shabaab’s leadership, as there have been no other credible reports of foreign fighters being at odds with the al Qaeda affiliate. Hammami has been feuding with Shabaab since March 2012, when he released a short video claiming his life was in danger. In October, Hammami released another video, in which he claimed that “friction” exists between Shabaab and foreign fighters. The October video was clearly recorded at the same time as the March video. After Hammami’s release of the first video in March, Shabaab quickly denied his claim that the group threatened to kill him. Shabaab did not speak publicly about the supposed feud until last month, when the group accused the American of being a narcissist who has been manufacturing the supposed split for personal fame. “The opinions expressed by Abu Mansour, the alleged frictions and the video releases are merely the results of personal grievances that stem purely from a narcissistic pursuit of fame and are far removed from the reality on the ground,” Shabaab continued. On Jan. 4, Abu M claimed that Shabaab had issued an ultimatum to surrender in 15 days or face execution. “Shabab make off annoucement in front of amriki: drop ur weapon b4 15 days or be killed. Its on,” Abu M tweeted. The next day, Abu M spoke as Hammami and said that he asks “Allah to make my death like sa’iid bin jubayr…the end of somalia’s hajjaaj” [emphasis ours]. Sa’id ibn Jubayr was a religious scholar and companion of the fourth Imam and was beheaded by an Arab politician known as Al-Hajjaj ibn Yusuf. Abu M may in fact be Hammami (the style of writing at the Abu M Twitter page is similar to Hammami’s), or one of his associates, such as Cabdulaahi Ahmed Faarax (a.k.a. 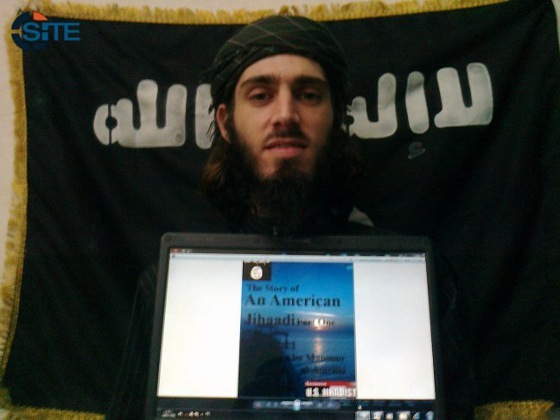 Abdullah al Amriki), another American jihadist, who was pictured with Hammami in December 2011. Abu M then fired off 26 tweets, which accused Shabaab of persecuting, imprisoning, and killing foreign fighters; executing civilians; hoarding the spoils of war; unfairly taxing civilians; allowing prostitution and drugs in some areas under Shabaab control; and other crimes. Abu M even likened Shabaab to the Nazis in their use of bureaucracy. “Like hitler they intentionally inject bureaucracy into the hierarchy out of psycho fear of a coup,” he tweeted. While some analysts have portrayed the feud between Hammami and Shabaab as evidence of a divide between foreign al Qaeda fighters and the Somali leaders, the likelihood is that Hammami allowed his personal grievances with the terror group to spill out into the open. Other than Hammami’s statements, there is no credible evidence of other foreign fighters having had problems with Shabaab’s leaders. Despite the deaths of top al Qaeda operatives Saleh Ali Saleh Nabhan and Fazul Mohammed, both of whom were senior leaders in Shabaab, foreigners continue to play a significant role in Shabaab’s command structure [see LWJ report, Al Qaeda leaders play significant role in Shabaab]. Less than two months before Hammami released his first tape claiming he was in danger of being killed by Shabaab, the terror group announced its official merger with al Qaeda. The merger was endorsed by al Qaeda’s emir, Ayman al Zawahiri. Immediately after the merger, the Muslim Youth Center (MYC), an Islamist terror group based in Kenya, announced that MYC is part of al Qaeda in East Africa, and has since issued numerous statements endorsing Shabaab and jihad in Somalia. Tanzanian jihadists, including some associated with MYC, have also praised the Somali terror group. Neither group has indicated that there is a problem with their fighters being sent into Somalia to fight alongside Shabaab. Additionally, Shabaab receives significant support and fighters from Somali populations in the US and Europe. And despite Hammami’s claim that Shabaab was preventing foreign fighters from leaving the country, it is well known that hundreds of Shabaab fighters have traveled to Yemen to support al Qaeda in the Arabian Peninsula. Additionally, small numbers of Shabaab commanders and fighters have been spotted in Mali and Nigeria. Hammami’s quarrel with Shabaab appears to be related to two key disagreements: his apparent demotion in late 2011, and his open criticism of Shabaab over military strategy. Al Qaeda “representative” Abu Abdullah al Muhajir [left]; and Sheikh Ali Mohamud Rage, Shabaab’s top spokesman. Image from Reuters. In October 2011, Hammami’s influence as the premier foreign Western jihadist was jeopardized when Abu Abdullah al Muhajir, an American, arrived in Somalia to dispense food, clothing, and Korans to Somali civilians at the behest of al Qaeda’s emir, Ayman al Zawahiri. Al Muhajir also appeared on video with Sheikh Ali Mohamud Rage, a top Shabaab spokesman [see LWJ report, American al Qaeda operative distributes aid at Somali relief camp]. Prior to al Muhajir’s arrival in Somalia, Hammami occupied a prominent place in Shabaab’s propaganda arm. He also served as a recruiter, financier, and military commander. He was even seen with Shabaab’s top leaders at a public eulogy for slain al Qaeda emir and founder Osama bin Laden in May 2011. But just months after al Muhajir’s appearance in Somalia, Hammami was on the outs with Shabaab. 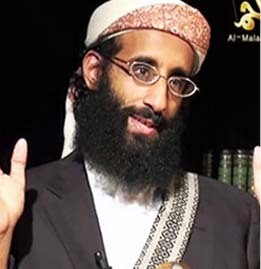 Al Muhajir’s appointment by Zawahiri as his personal emissary may have been perceived as a slight by Hammami, who, if his writings and propaganda videos are any indication, has an inflated opinion of himself. 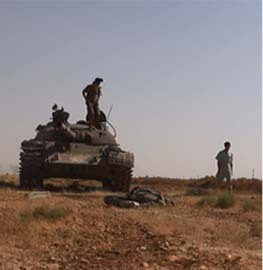 Additionally, Hammami is known to have carried on a very public dispute with Shabaab over its military strategy. Hammami was critical of Shabaab’s and its predecessors, the Islamic Court, strategy during the Ethiopian invasion of Somalia late 2006. Hammami argued that Shabaab wasted fighters and resources by waging open warfare against a militarily superior enemy, and that the group instead should have carefully withdrawn its forces and waged a guerrilla campaign. Hammami’s contempt for the 2006-2007 campaign was on public display when he released his narcissistic autobiography in May 2012 [see LWJ report, Omar Hammami releases part 1 of autobiography]. Considering Hammami’s open dispute with Shabaab’s leadership, the terror group has been remarkably tolerant of his antics. While Hammami has supposedly only been under house arrest, he still appears to have access to the Internet as well as his sympathetic associates. 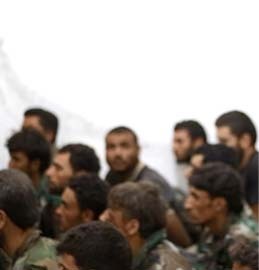 Although Hammami has repeatedly claimed that his life is in danger, he remains alive to this day. Other al Qaeda affiliates and allied groups have executed dissenters for far more benign statements. Shabaab waited eight months before publicly weighing in on Hammami’s statements and his autobiography, and even then sought to bring him back into the fold, at least according to Shabaab. “The Mujahideen have been offering advice to Abu Mansour [Hammami] in private, without publicly rebuking him, employing every possible avenue to veil his faults, overlook his shortcomings and conceal the egregious errors he’d committed ….” Shabaab said in its mid-December statement. The following tweets are listed in reverse order; the most recent tweets, from Jan. 4, are at the top. One brother was forced to the border twice. He almost died of thirst. Upon return they imprisoned him for being a new group! Berger.. The godwins were amriki’s nextdoor neighbors. Shabab actively send people to act like apostates. Infil. But well known fighters are jailed at the mere notion of poss. apos. Each shabab city has a redlight district where qaat is halal. Other parts its haram/jail. But they take taxes on it. To the somali twitter haters: ure somali. U have an interest in making urself look good. Amriki doesnt. He says it like it is. I ask Allah to make my death like sa’iid bin jubayr…the end of somalia’s hajjaaj. Shabab make off annoucement in front of amriki: drop ur weapon b4 15 days or be killed. Its on. BLUF Shabab aren’t the khilaafah and muslims aren’t their slaves. Being shabab isn’t oblig and spreading jihad is. I like the Bullwinkle antlers hat. Nice touch. I disagree with your repeated claim that there have not been any other disputes/splits between Shabaab, other than with Hammami. 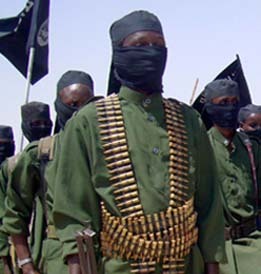 It is known for a fact, that Shabaab have always had disputes with rival groups. Immediately following the Ethiopian withdrawal around 2009, the Somali groups had already divided into several splinters. With Al-Shabab and Hizbul Islam, being the ones continuing to fight against the TFG, and rival Islamists (such as Sheikh Sharif and the Sufis) allying with the government. Soon after, Shabab engaged in repetitive clashes with Hizbul Islam. Including a major clash over control of the port city of Kismayo. Which they successfully grabbed away from Hizbul Islam. This was in Nov/Oct 2009. 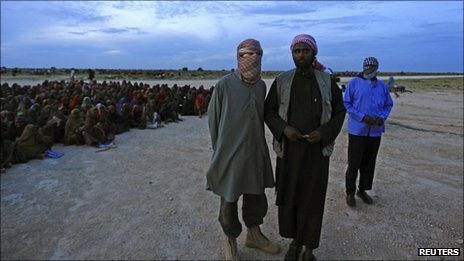 One of Hizbul Islam’s own factions, the Ras Kamboni Brigades, defected to join Al-Shabab. This was in Feb 2010. In early Dec 2010, there were more clashes between Hizbul Islam and Al-Shabab over control of territory. Following Shabab threats to behead the Hizbul prisoners, Hizbul surrendered on Dec 20, 2010, which Al-Shabab announced to their crony media/forums as a “merger”. By Sept 2012, Sheikh Dahir Aweys and his group had once again split with Al-Shabab. I have not seen any mention of these events in your article. The rivalries between Shabab and others are well-known, if one only looks into it. Furthermore, there are clan differences, that have also been covered by some other blogs. There is a drone out there with his name on it. His parents must be proud of him. Any chance on getting some background info on him, regarding his upbringing and where he is from in the US ?? Settle it with both of you shooting RQGs at each other. HUH??? What a bunch of idiots. I think you should shoot it out to settle your differences. Thomas, are attributing arguments to me that I never made. I said there is no evidence that their is a major split between Shabaab and the foreign fighter contingent. I did not say that there has never been disagreements between jihadists in Somalia. Of course there has. 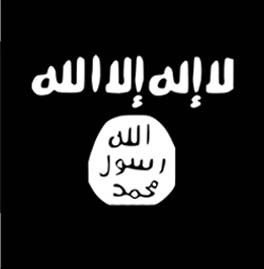 They need to target Abu Abdullah al Muhajir and leak that Omar Hammami supplied the information. Breed some more paranoia into al-Qaeda and company. 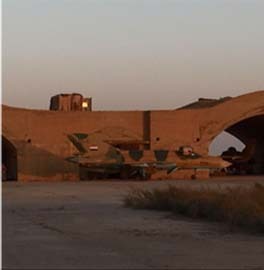 Plus they will probably be far more imaginative about Omar Hammami demise. Anyone want to offer up an opinion on how this dispute will be handled proving bad feelings continue to escalate? Would Shabaab be so bold as to kill Amriki in a public manner and risk the potential fallout of alienating other foreign jihadi’s? Since they have publicly aligned themselves with al Qaeda would Zwahari need to sanction a dismemberment video?